First released in 2012, the Proform Power 995 treadmill is powerful and solid. It arrives with a price tag of $999.99 and with a size of 20 inches by 60 inches, it has a larger belt than the majority of home treadmills. It is also a gym quality treadmill that is powered by the 3.0 CHP Mach Z Commercial Motor designed to withstand intervals, endurance runs or speed training. This product from ProForm also has a 0 to 12 MPH QuickSpeed Control that enables users to instantly change the treadmill’s speed to burn more calories, add intensity to their workout and boost their performance. 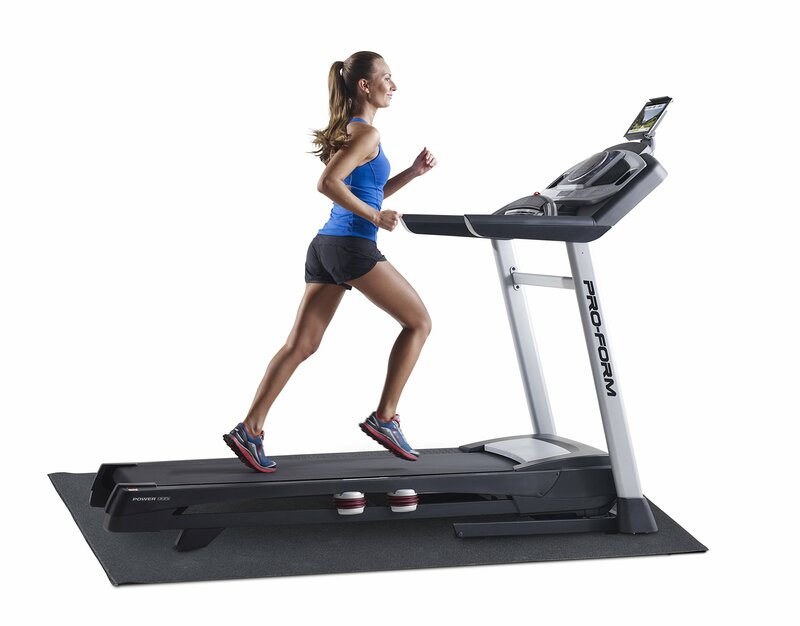 This treadmill also has ProShox Elite 2 cushioning that helps reduce impact on the joints while working out. Aside from that, it has a Folding SpaceSaver Design with EasyLift Access. This is a shock assist system that makes it easy for people to fold the treadmill vertically and obtain floor space. The Proform Power 995 also features 10 weight loss and 10 performance workouts that are designed by a certified personal trainer. It also has a quick incline control with 0 to 15 percent incline available. Many people like this treadmill due to its comfortable size. It has a sturdy construction and is easy to assemble as well. Although it is very large, a lot of users do not feel that it is clumsy or bulky to work out on. The ProForm 995 also has an LCD screen that is very large. This enables people to easily determine the distance that they have run, the speed and the calories burned. In addition, it shows where they would be when running a lap on a standard-sized running track. The LCD screen is also not hard to use, and the workout parameters can be changed with a single touch of a button. Users like the iPod connection found on the treadmill as well. The locking bar also works great. Running and walking on this treadmill is also nice due to its size. The shock absorbers seem to do a great job in providing a cushioning effect. The process to lift it is very smooth, and the treadmill will not slam into the ground if they slip. It also has built-in speakers with good sound quality. Users also like the fact that the motor is powerful but gives them a noise-free workout without any distractions. People also like the console fan found on the treadmill. This is because it provides an added level of comfort during workout sessions. Aside from that, people like that the machine can be folded neatly after a workout. People also like the price tag. This is because they are getting a treadmill that has the same number of features found in more expensive models. Unlike its competitors, the Proform Power 995 supports iFit technology. This enables users to experience trails from all over the world with all of the declines and inclines. Other features of this technology include an activity tracker, motivating emails, text messages and workout videos available for download. People also like that the warranty has been upgraded for the 2014 model with three-year parts coverage, one-year of service and lifetime coverage on the motor. Although the inclines are great, some users complain that the belt has a hard time keeping a steady speed at inclines of 12 degrees or higher. Some users even noted that the belt seems to pick up speed whenever they incline walk at 12 degrees or higher. Aside from that, the motor does not seem to be able to keep a steady speed. People do not like the fact that they cannot enter their weight on the ProForm Power 995. The belt also makes noise while it is in motion that is much louder than other treadmills. The hand rails are another thing that needs improvement. The present design is quite short making them a bit awkward. The treadmill’s heart monitor is not accurate, and some users purchase a separate one to give them an exact reading during their workouts. Aside from that, the covers on the arms do not match tightly and leave a gap. Although it is very easy to assemble, some people noted that the screws do not screw in easily and there are misaligned holes. The ProForm Power 995 Treadmill is designed for the serious fitness buff who is searching for a wide variety of workout apps to suit their needs. There are not too many treadmill models that offer the features, sturdiness and power that the ProForm 995 does at the same price point. Even the most serious runners will be happy with the machine’s user-friendly interactive features and smooth performance. Despite a number of drawbacks such as the belt picking up speed on inclines, this is a great treadmill that is highly recommended.